We are delighted you have chosen River Region Dentistry and look forward to seeing you. 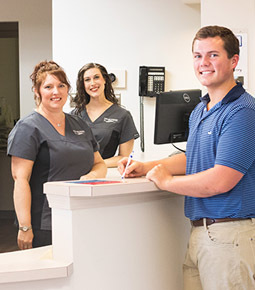 Our goal for you at River Region Dentistry is to provide a customized and personalized dental experience. To accomplish this, we will have you come in for a comprehensive dental evaluation as part of your first visit with us. This detailed exam consists of a past medical history review, a full-mouth radiographic exam, a TMJ exam, an occlusal exam, an oral cancer screening, a periodontal screening and a careful oral exam. After we complete our thorough examination of your dental health, we will discuss any oral conditions we might have found and the treatment options available. We want you to be able to leave your first visit with a large variety of treatment options, as well as estimates for each option so you can feel confident about any decisions you make. Additionally, our knowledgeable team is available to answer any questions you might have in order to help you better decide which treatment path you would like to pursue. Our initial evaluation insures that you have all the information you need to make an informed decision regarding your care and allows your treatment to proceed in an orderly and efficient manner. 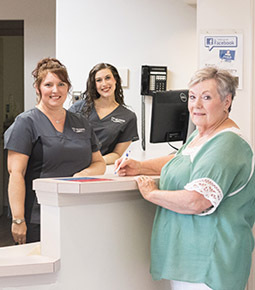 Following your initial visit, our friendly front desk team will help you schedule any required treatment and/or your regular preventive dental cleaning. If you have questions regarding your account, please contact us at (334) 272-0110. Many times, a simple telephone call will clear any misunderstandings. We are a Blue Cross of Alabama Preferred provider and we are also in the United Concordia network.